After 7 years on Walnut Avenue, The Hub for Sustainable Transportation is moving to a new location. 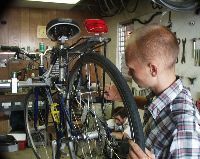 Our primary projects are the Bicycle Church, a self-service community bike shop and tool co-op open 6 days per week, and People Power!, a local advocate and educator for cycling and non-auto-dependant transportation and planning issues. We share space with and are supported by Pedaler's Express, the human-powered delivery collective. As of January 1st, 2006, we will be opening our doors at 703 B Pacific Avenue, just south of Laurel St. The Bicycle Church is expanding from roughly 200 to 1000 square feet! This means more tools, more stands, better service and a better shop environment. We are also building a new community meeting room available to local groups, and improving our office facilities. All of this requires an extensive remodel to the new building.